A Revolutionary War and World War I historian, Lengel argues that the idea of a uniquely “American Way of War” dates back to colonial days, and especially to a dramatic, and losing, battle in which George Washington played a major role. The ideas about American versus European tactics and military behavior that this battle generated continues to influence the United States today. In this talk, Lengel shows how concepts applied during the Revolutionary War inspired General John J. Pershing’s conduct as commander of the American Expeditionary Forces during World War I — sometimes for the better, and sometimes for worse. Edward G. Lengel received his B.A. in History from George Mason University in 1991, and in 1998 he received his Ph.D. from the University of Virginia, where he directed the Washington Papers Project for many years. He served as Chief Historian of the White House Historical Association from 2016 to 2018. Lengel has written several books on George Washington and World War I, including his recently released book, titled Never in Finer Company: The Men of the Great War’s Lost Battalion. Lengel leads history and battlefield tours throughout Europe and the United States. He writes regularly for Military History Quarterly, American History and other periodicals, and has made television and radio appearances on The History Channel, Fox News, SiriusXM, and National Public Radio. He also appears on the World War I Centennial Commission’s weekly podcast. The event starts at 7 pm and will be held at the Fort Plain Museum located at 389 Canal Street in Fort Plain, Montgomery County, NY. 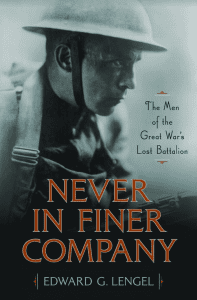 The author will be signing copies of his new book, Never in Finer Company: The Men of the Great War’s Lost Battalion. Light refreshments will be served. There is a $5 suggested donation to attend. The museum, bookstore and giftshop will be open. For more information visit Fort Plain Museum’s website. Book Purchases made through this Amazon link help support The New York History Blog’s mission to report new publications about the history of New York. You can contribute directly to the New York History Blog at our Rally.org fundraising page. Books noticed on The New York History Blog may have been provided by their publishers.